My love for the ocean brought me to the Sydney Northern Beaches in 1990 where I live with my husband. I was born in Austria and migrated to Australia with my family as a young child – German is my first language. I am fortunate to still be able to speak German fluently and I am passionate about foreign languages. My background is in Communication and the Real Estate Industry, predominantly in a customer service environment. Being appointed as a Civil Marriage Celebrant in 2004 has allowed me to indulge my passion of the outdoor, the sun and the water. It is my commitment to provide a relaxed, professional service, in an environment which reflects your personalities. I will strive to make your Wedding Day one which will stay in your memory for life. You can rely upon me! 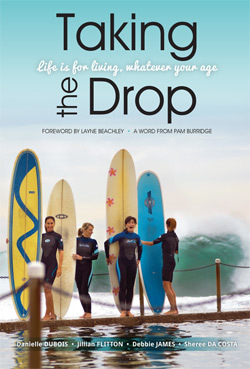 Danielle is also the co-author of Taking the Drop, a life-affirming story of four women who took up surfing in their forties, broke away from their existing daily routines and steered their lives into new directions. With an exciting and sometimes hilarious take on surfing, this book reveals insights into their life journeys and their passion for finding the “perfect wave”.